But how are they going to get it out of the room? At 140 feet, it has the wingspan of a Boeing 737, but carries no passengers—and it’s much lighter too, weighing in at no more than 1,000 pounds. And within the next couple months, Facebook hopes to get its drone off the ground on an inaugural test flight. Named Aquila, the aircraft is the product of more than a year’s work at the social networking giant. Its function is not to drop retail items from the clouds like Amazon’s drones, but to provide Internet access to the hundreds of millions of people who don’t have it in under-served parts of the world. 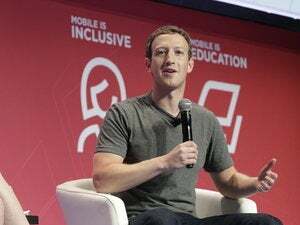 Facebook aims to partner with carriers and other companies to provide connectivity, potentially at a lower cost than typical infrastructure like cell phone towers. Aquila comes out of Facebook’s Connectivity Lab, formed last year to develop new technologies for expanding Internet access. The company also hired team members from U.K.-based unmanned aircraft maker Ascenta. The drone is just one element in the company’s master plan to improve Internet access, which also includes satellites and data-carrying laser beams. But it might be the most awe-inspiring. “If you think about these little quadcopters, that’s not what we’re building,” said Jay Parikh, Facebook’s global head of engineering, during a talk on the status of the company’s efforts at Facebook’s headquarters in Menlo Park, California, on Thursday. The plane’s entire surface is covered with solar panels. It’s meant to stay up in the air for three months at a time, at an altitude between 60,000 and 90,000 feet. That’s above commercial airlines and above the weather. It could potentially provide Internet access to people in a 50 kilometer radius, Facebook says. Facebook claims to have reached an historical milestone with its laser system: It’s capable of beaming data at the rate of tens of gigabits per second. That rate, and higher rates, is routine for the fiber optics in data centers. But to achieve that rate through space and air, “it’s never been done before,” said Yael Maguire, Facebook’s engineering director of connectivity. Google, meanwhile, has developed balloons to beam down LTE cellular signals. They’re meant to fly in Facebook’s desired zone, between 60,000 and 90,000 feet. The company so far has launched at least hundreds of test balloons, and it’s close to launching thousands. For Facebook, Google’s existing presence in the stratosphere looms large. To launch, Aquila will require a helium balloon, which will get it above commercial airspace quicker, Facebook engineers said. They didn’t say whether Aquila would rise above Google’s balloons.